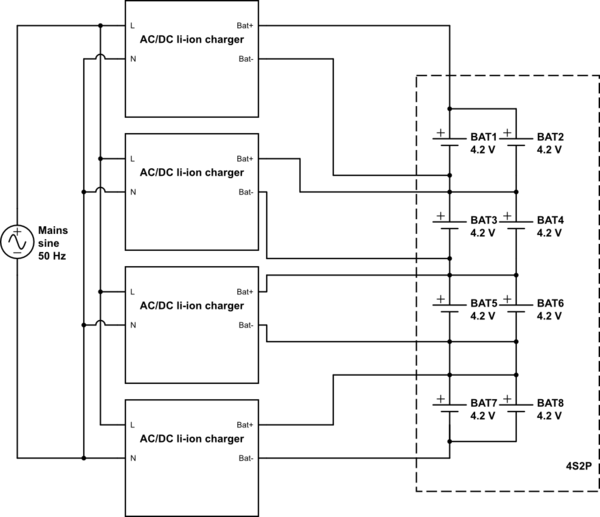 I am currently working on a project, which should contain a Li-Ion battery pack in the form of 8 18650 cells in 4S2P. The main consumers of the build are a class D amplifier and a single board computer, probably a Banana Pi Zero. I would like to have a charger and balancer circuit integrated in the project, which would ideally be controllable in some form by the SBC. A charging voltage from 16V DC (or higher if needed) would be supplied by a power jack. I have looked for charging and balancing ICs, the only suitable one I found, is the BG24702/3 from TI. It could handle the charging, but requires a huge amount of external circuitry. Do you know a good and/or simple method for charging and/or balancing? Is it possible to get a simple CC/CV power source and then charge and balance periodically? If you don't want to charge from mains, substitute your AC/DC charger with a DC/DC one, but isolated/floating.